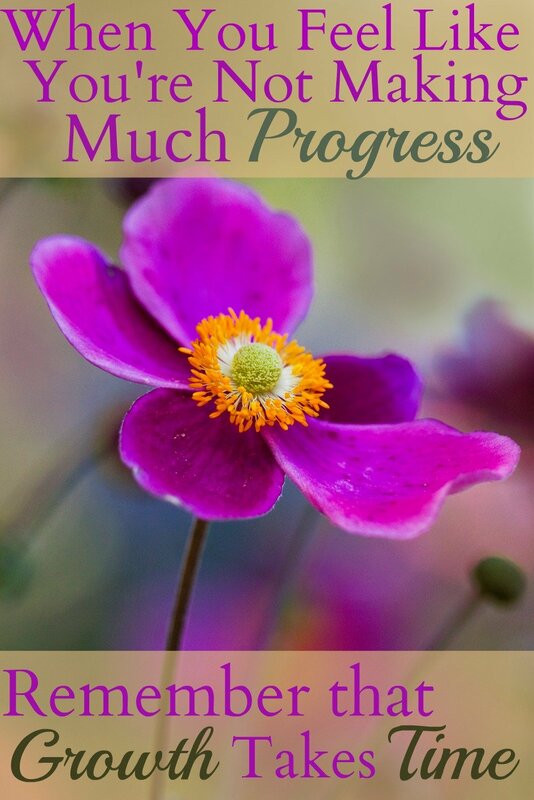 Have you ever felt like you’re just not making any progress? Maybe it’s with your personal growth, your career, a new hobby, or your marriage. Or maybe you’re pouring your heart into your kids or your students and it just seems like they’re not getting it – like everything you say and do is going in one ear and out the other. Yes, growth doesn’t happen overnight. It happens step by step, little by little, moment by moment. I sure wish that my desire to be a better wife and mother meant that I would wake up tomorrow having mastered both of these roles. I wish my desire to know God more would result in a my relationship growing by leaps and bounds by the end of the week. I’m only twenty-seven, but looking back on the last ten years, I can see how God has grown me step by step, little by little. I’ve learned, grown, and matured, mastered new skills and deepened my understanding of Him. But while there have been some great ah-ha moments, most of the growth happened day by day, little by little – slowly. So when we start to get frustrated, to feel like we’re never going to master this new aspect of life – never going to figure out how to manage a classroom, never going to know what to say when our kids ask us a hard question, never going to have victory over a particular personal struggle – we need to remember that growth takes time. We need to look back and see how far we’ve come and look forward with anticipation to the growth we’re going to see over time. In a word, we need to be patient. I think this is particularly hard for new teachers. I remember thinking as a first-year teacher that I hadn’t really seen any amazing turnarounds, and I was a little disappointed that I didn’t have any amazing transformation stories like it seemed that every other teacher did. But then something amazing happened over the next couple years. I got to see those students into whom I had poured my time, love, and focus start to grow up, start to mature, start to make some real progress. And it was so rewarding to see! I remember one student in particular who simply didn’t like me and I really think was just trying to make my life miserable. Over time, she made a complete 180 and turned into one of my biggest blessings. [I tell more of the story in my post What to Do with the Kid Who’s Driving You Crazy.] But here’s the key – this change did not happen overnight. In fact, it did not even happen over the course of a few weeks or even months. It wasn’t our third year together that she came to me and said “wow, I can’t believe I did all those stupid things as a 6th grader.” Talk about a great moment! But it took a long time to get there. And the change happened – you guessed it – little by little. So yes, there will be moments of epiphany, moments of great breakthroughs, days that you think “wow, today I made some great progress!” But there are so many more days where it seems like nothing is happening, nothing is moving, nothing is going in the right direction. During these times, remember that growth happens little by little, a day at a time. That is, as long as you’re open to it. Can you look back and see growth that at the time didn’t seem to be happening? What frustrations have you experienced when you wanted to see progress more quickly than you were? Share your thoughts and experience with a comment below. I only found your website and blog a couple of weeks ago, but I’m being blessed by it continually. It’s so great to hear from a someone who has not only the experience of years of teaching, but also a heart for serving God and discipling students. I’m an Australian student teacher – teaching one Year 7-8 English class while I finish my last year of uni – and I can really relate to your post about the learning curve and now to this post about being patient when it comes to growth. I think this will be particularly relevant after my students complete their first assessment next week! Thank you for sharing your thoughts with us, your readers. I thank God that I stumbled across the site and I’ll be catching up on old posts soon. This year is my 6th year of teaching kindergarten, my 12th year of teaching overall. I have had up to 24 kids in my class. Now I am at 22. Out of those 22, only 3 are at or above reading level expectations. The rest are 1 or more levels below. I am really feeling the stress, but looking back, they have all made progress, even my student who has finally been diagnosed with a learning disability. I have been so discouraged and stressed b/c this student required so much more of my time. Really should have been getting more in class support, but anyway, this article is encouraging for me because my pride says that all of my students should be at or above district read expectations. But each of my students is fearfully and wonderfully made. Unique and loved by God, and grows at their own pace. I desperately needed this reminder. Thank you so much. It sounds like you are doing a great job! You may also find this article helpful- https://teach4theheart.com/5-easy-accommodations-for-special-ed-or-struggling-learners/.